The badge is in the form of a letter 'B' in Lombardic script and appears to be near-complete (with a length of 22.0mm, a width of 17.4mm, a thickness of 1.0mm and a weight of 1.8g). The front face would have been flat and is now a little distorted. The letter has a straight upward bar with serifs projecting to the rear. The letter widens slightly at the curving outside end and is narrowest at the middle central bar. The face has no further decoration. The rear face is less finished and has the stubs of the two attachment spikes (with a diameter of 3mm and giving a maximum depth of 3.3mm) positioned on each side of the central bar. The surface has a dark-grey corrosion. 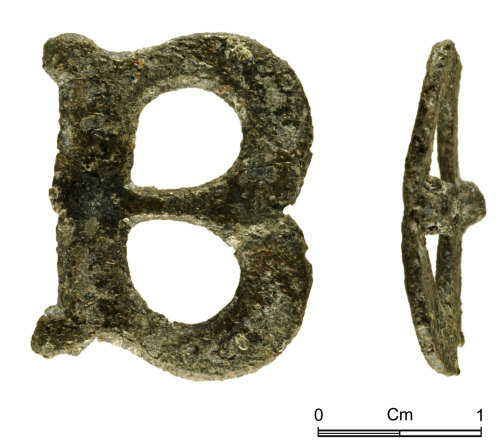 ~~Single letter mounts with one or two attachment spikes are known to have been used as pilgrim souvenirs and is likely to represent the initial letter of a saint's name such as St Barbara, St Blaise, St Bridget and others, or a place name with a shrine. A more elaborate letter 'B' including an integral depiction of St John within the letter has been recorded from the Thames near Queenhithe (Spencer, 1998; no. 208o, p 195-6) associated with the shrine of St John of Bridlington.